All the way back in November of 2012 I posted about a PC collection website I created called "The Card Boarded Collection" where I could share all of my scans in one place. Well, five years later I am still using it, but have made a ton of minor tweaks along the way. I am now in the process of updating it to include my latest pickups and a lot of other things that have been shown on the blog but not uploaded to the site. It is a pretty basic looking site and I wanted to keep it that way since it's purpose is just to show off my collection. I set up each collecting project with it's own page. Beyond that there is only a quick description at the top and then a gallery filling up the rest of the page. I think this is the best way to do it so I don't have to get into pages and pages specific to inserts, autos, etc. It's a nice way to be able to take a quick look at my collection without actually having to physically be in my basement where all the cards are stored. This site was built using the free Weebly service. Anyone else still use this or a similar type of site to show off their collection all in one place? I highly recommend it since it's free (at least for now) and relatively easy to use. Click here for more info. It's hard to believe that I've been collecting cards of Jimmy Howard for seven years now. Time flies, doesn't it? While there haven't been a ton of new additions in the last couple of years, he is still one of my favorite players and one that I will continue to collect. Thanks to Chris over at The Collector, I have a bunch of awesome new Howard cards to show off. 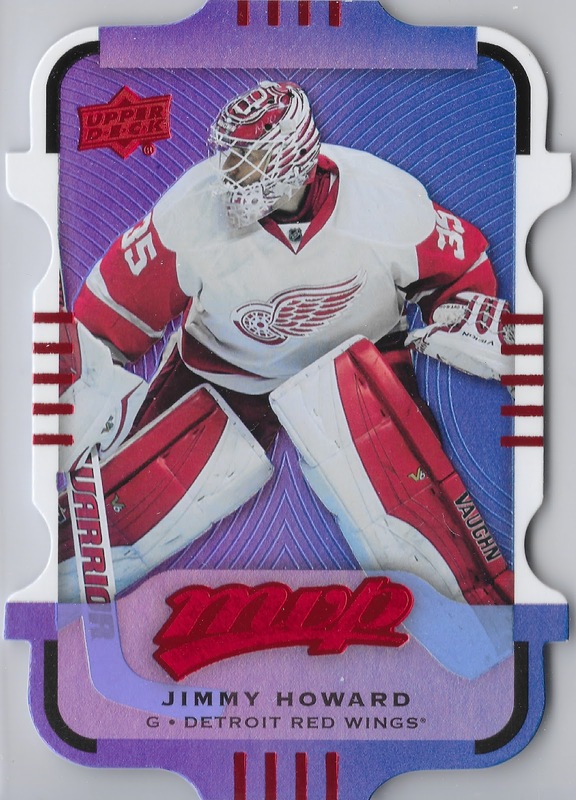 The first one and my favorite is this cool die-cut card from 2015-16 Upper Deck MVP. Technically it is a Level 1 Purple Colors & Contours parallel. Talk about a mouthful there. I love base set parallels so this one was perfect for me. The die-cutting is a bit crazy and reminds me of some of the great stuff from back in the 90's. 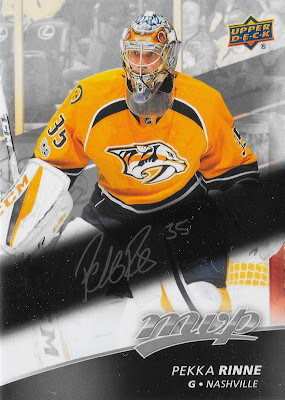 Up next is another colored parallel from the same MVP set. This time it is the green version of the base card. From what I remember, these could be obtained by combining 20 digital copies of any given base card on Upper Deck's ePack site. The green gives a nice contrast to the red and white of the Wings uniform, perfect for the day after Christmas. Here we have the Silver Script version of the base card. 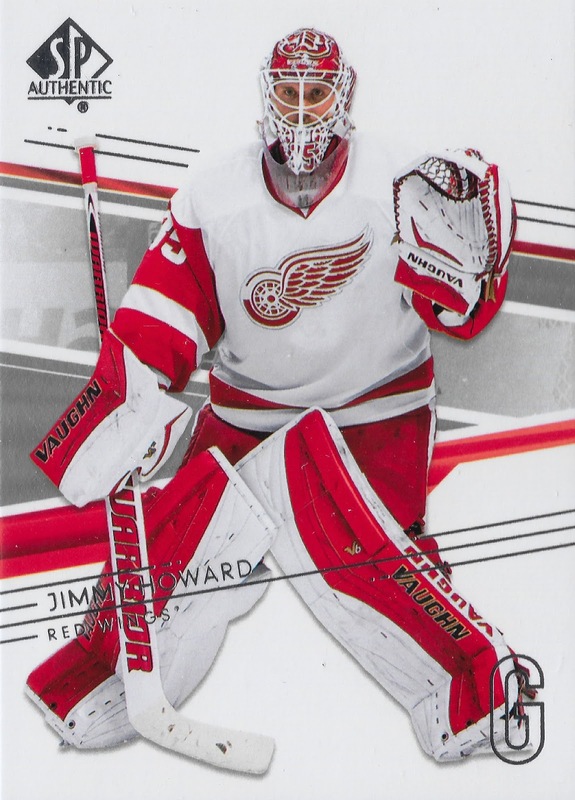 It helps that Howard has a nice signature for cards like this. The other thing I like is that they decided to go with the silver foil on the MVP logo. 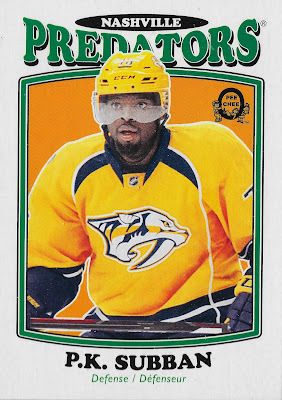 If only they had done the same for the Upper Deck logo in the corner. More 2015-16 MVP, this time the regular base card. 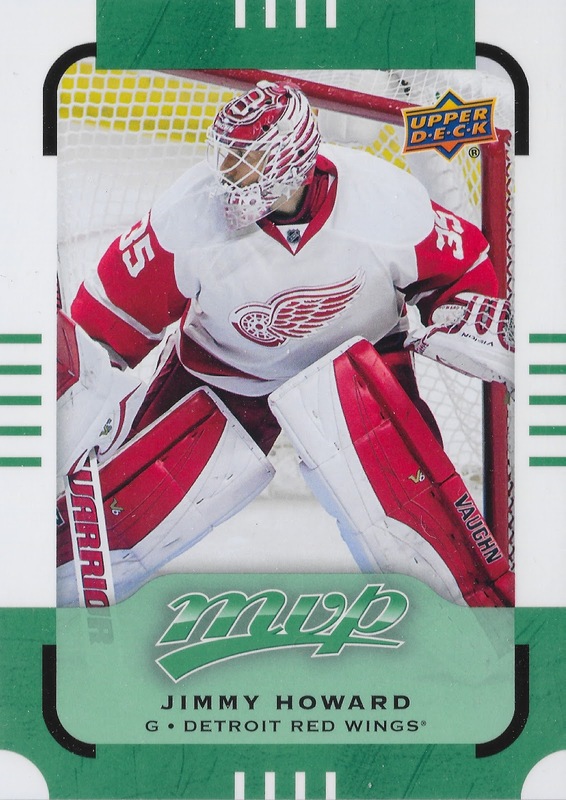 While this base design is a bit nicer than some of the other recent versions, I still miss the days of the older MVP logo and the foil on the front of these cards. They just seem cheaper to me without any of the foil. This post is definitely heavy with MVP. Here we have another Colors & Contours parallel, this time from the 2016-17 version. This is a Level 1 Teal version. The die-cuts are just as crazy with this set. Howard is also shown with his Christmas mask, so that's cool too! Here is the green version of the base card for 2016-17. Unlike the previous season, this time they included a green facsimile signature on the front. I just wish this and the MVP logo were done in a green foil, that would look sweet! 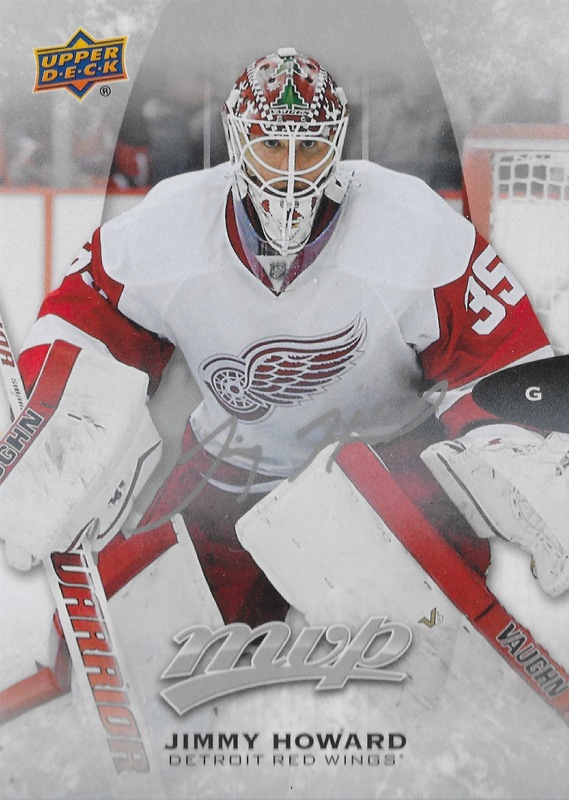 The last of the MVP's is this Silver Script version of the same card. Again, I wish they would've done everything in the silver foil. It just does not seem like as nice of a card without it. Does anyone else really miss the older MVP sets now? 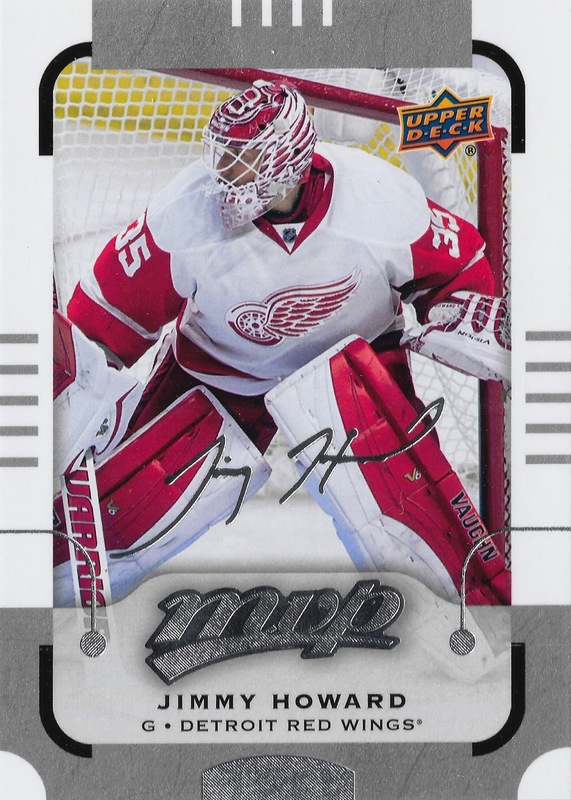 Moving on, we have this nice card from 2014-15 SP Authentic. While there are a lot of lines going every which way on this card, I really like the overall look. The red accents really help too. This is one of the better looking base designs I've seen for SPA. 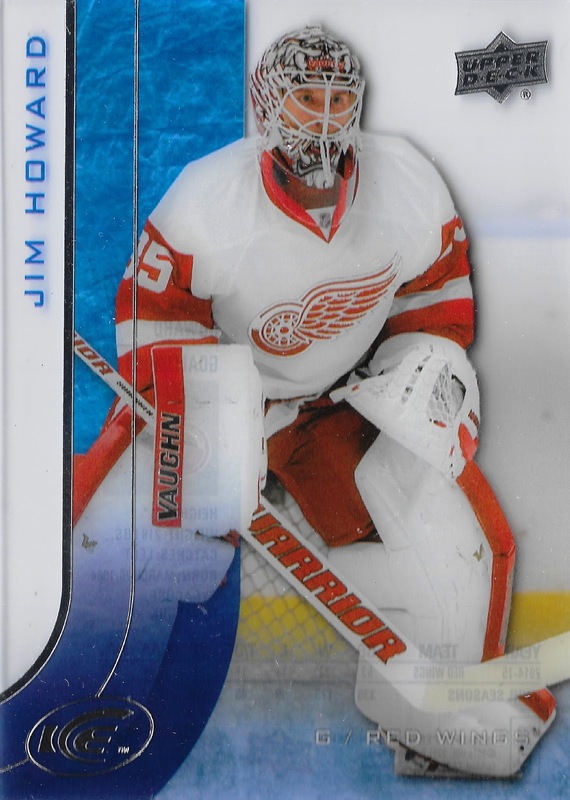 More SP Authentic, this time from the 2015-16 base set. This one is really nice too and I love the use of the team colored accents. 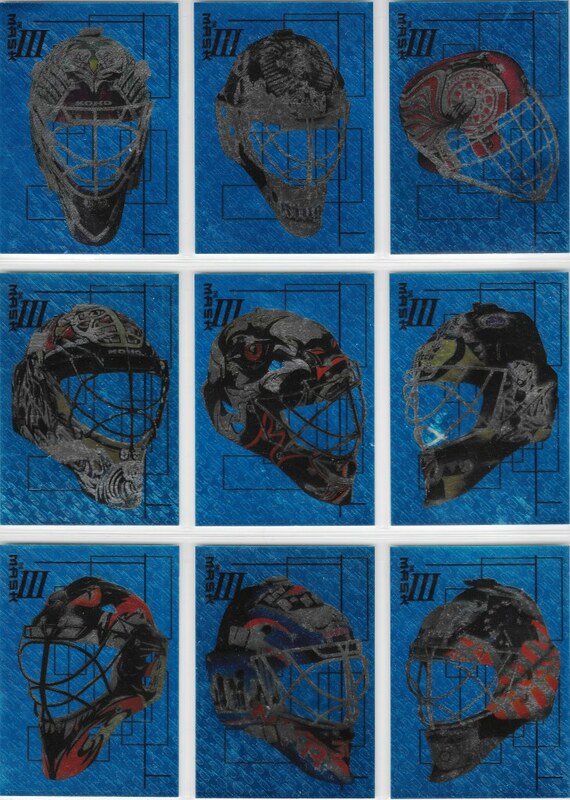 This even features one of Jimmy's best mask designs, so it is definitely a great addition to the collection. 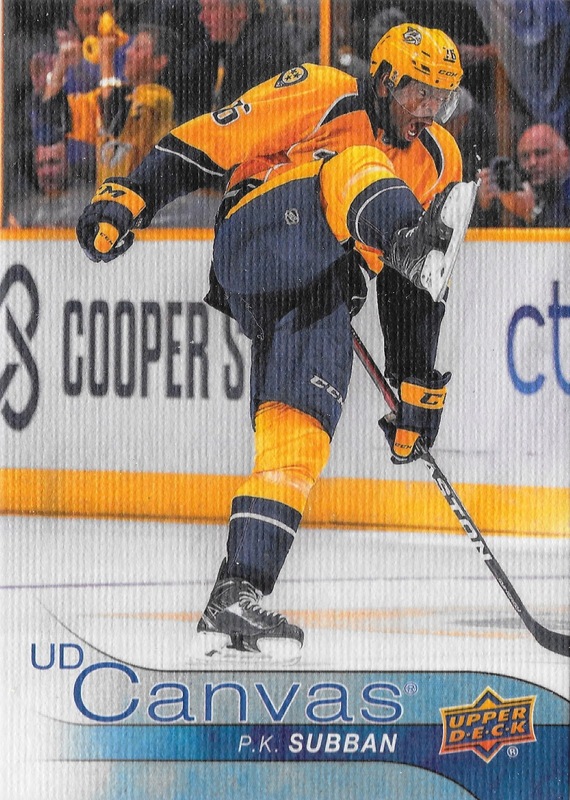 Up next is another base card, this time from 2015-16 Upper Deck ICE. This is a pretty cool looking set and the blue elements of the design just work really well for whatever reason. The only thing I don't understand with this one is them shortening his first name to Jim. I haven't seen that on any of his cards since his rookie season back in 2005-06. Here is another cool one, this time from 2014-15 UD Masterpieces. I think this is the first painted design like this for my Howard collection, so that's neat. I just wish they would've done a picture with his mask on to showcase the great paint job. 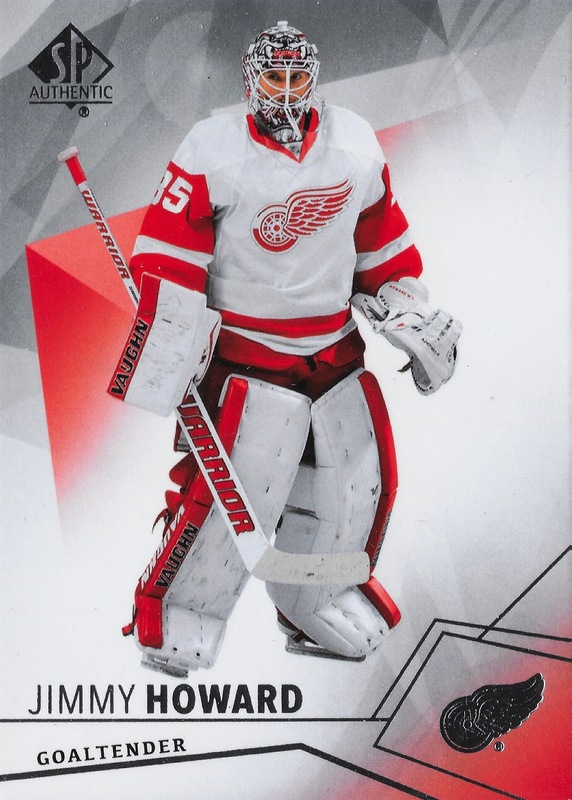 Champ's is another set that I do not have much of in my collection, so it was nice to add this one of Howard. This one is from the 2015-16 version. The design is very nice overall and I love the effect of making the background of the picture black and white. It really make the player image pop against the rest of the card. 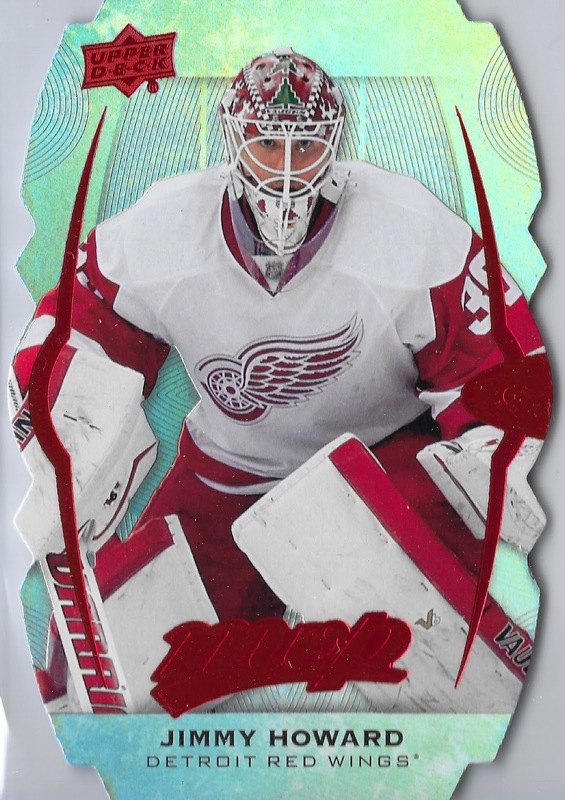 This next card is one that did not scan the best, but looks awesome in person. 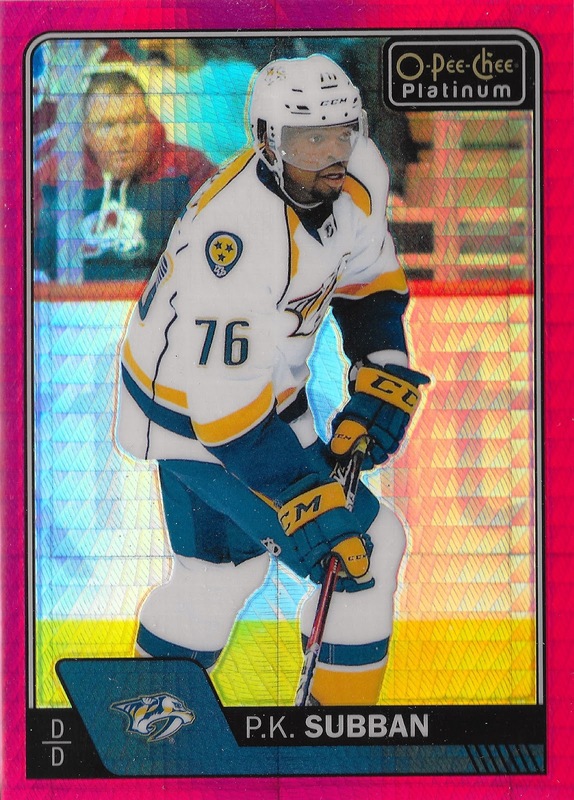 It is a base rainbow parallel from 2015-16 O-Pee-Chee Platinum. It's kind of like a refractor and changes color as you turn it in the light. Now I just need to find some of the other versions to go along with it. The Black Ice and Traxx versions are pretty sweet looking. 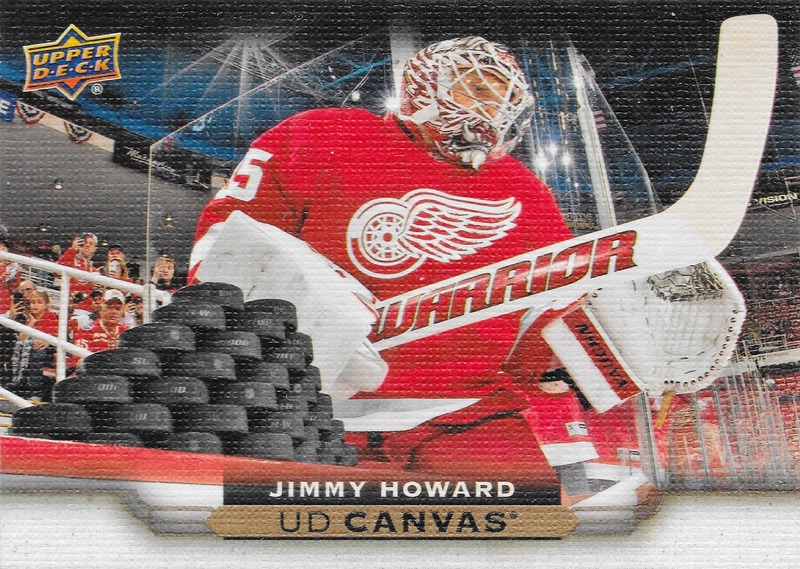 Here we have a UD Canvas parallel from 2015-16 Upper Deck. 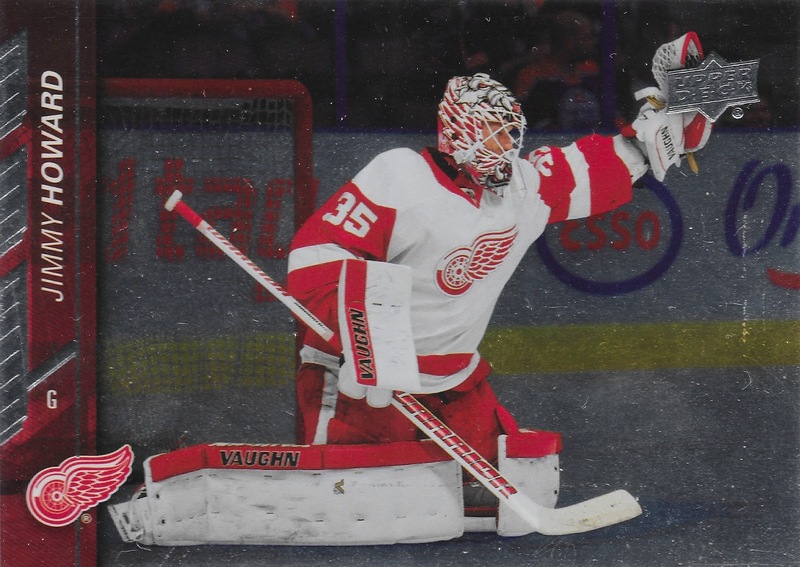 It has an awesome photo of Howard entering the rink next to a stack of pucks for warm-ups. It's kind of neat that you can see a bunch of fans taking pictures in the background. This next card is probably one of the worst looking scans I've had in a while. It comes from the 2015-16 Upper Deck Full Force Blueprint set and actually looks pretty cool in person. 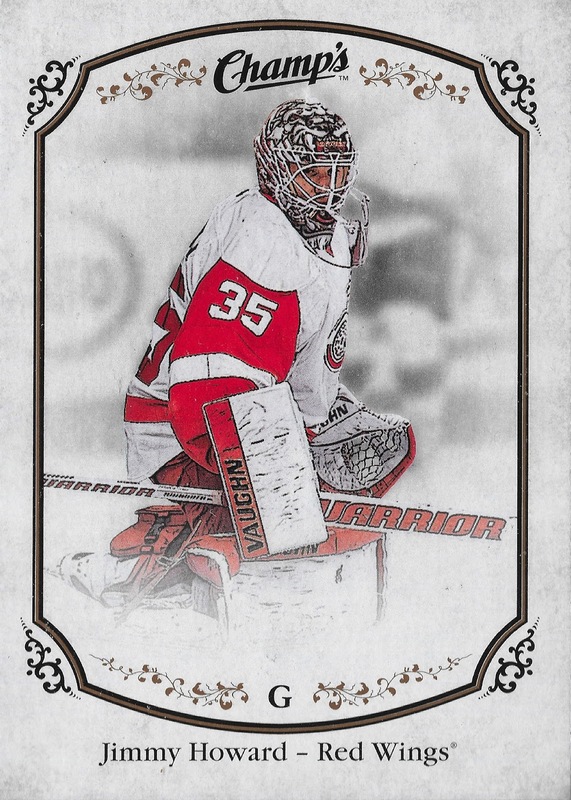 Last but not least we have a silver foil base card from 2015-16 Upper Deck. This was another one of those ePack deals where you had to collect so many digital copies to be able to redeem them for a silver foil version. 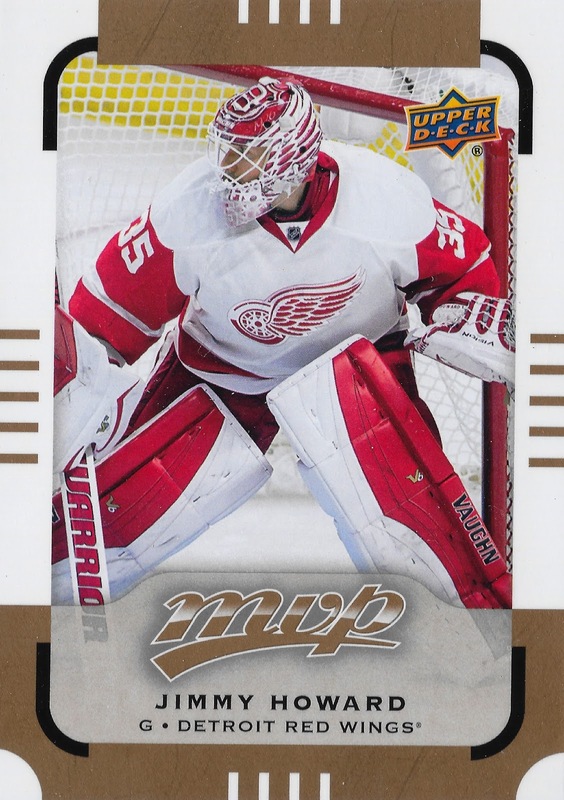 I actually did quite a bit of trading on ePack back then and have one of these in my account there (along with most of the other Red Wings from the set), I just never got around to redeeming them. This will likely be my final post for 2017. I'm not really sure what I will be doing as far as collecting in 2018 as I am still using most of my hobby time for building my model railroad. I do still plan on reading card blogs and searching for the right deals on eBay though, I just don't know how often I will be posting on here. Finally, I have some cards to show off for my newest side project. It was back in September that I decided to start this one, then I got busy with model railroading and never really bought anything to get started. Well, thanks to Chris over at The Collector I was able to get some very nice cards to get my Smashville project started. These cards were part of the prize package from his Great Trader Giveaway Contest. The first one features Pekka Rinne and comes from the 2017-18 MVP. 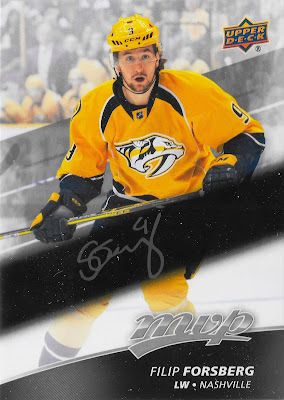 Up next is a Filip Forsberg from the same set. While this MVP design is not my favorite, I do like how much the gold jerseys stand out from the rest of the card. This one is a Roman Josi silver foil base card from 2016-17 Upper Deck Series 2. I like how the player image stands out from the background here. 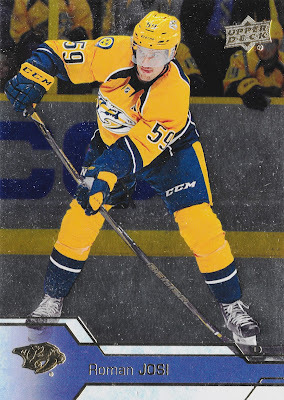 It also helps that the base set design is blue so it works well with the Preds color scheme. 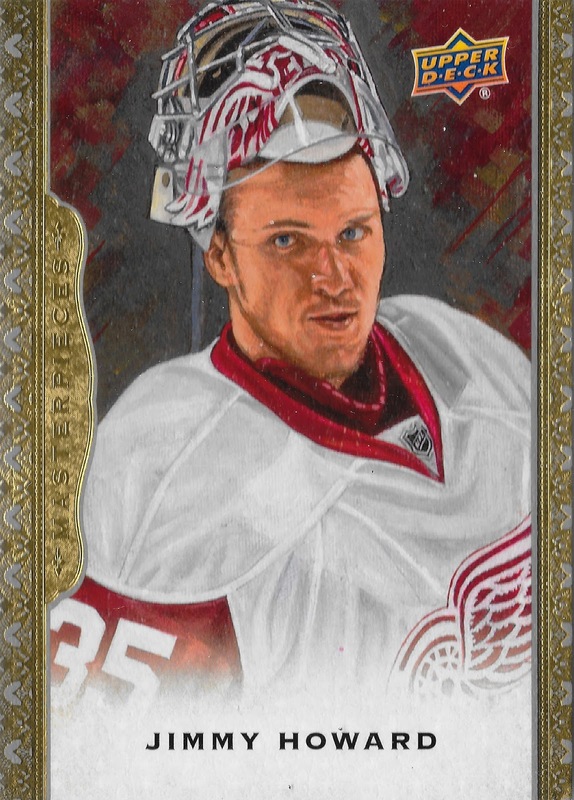 Up next is a UD Canvas card with a sweet picture of what I believe is P.K. Subban celebrating his first regular season goal with the Predators. He became one of my favorite players to watch on the Preds during the playoffs and I even bought one of the jersey shirts with his name and number on the back. 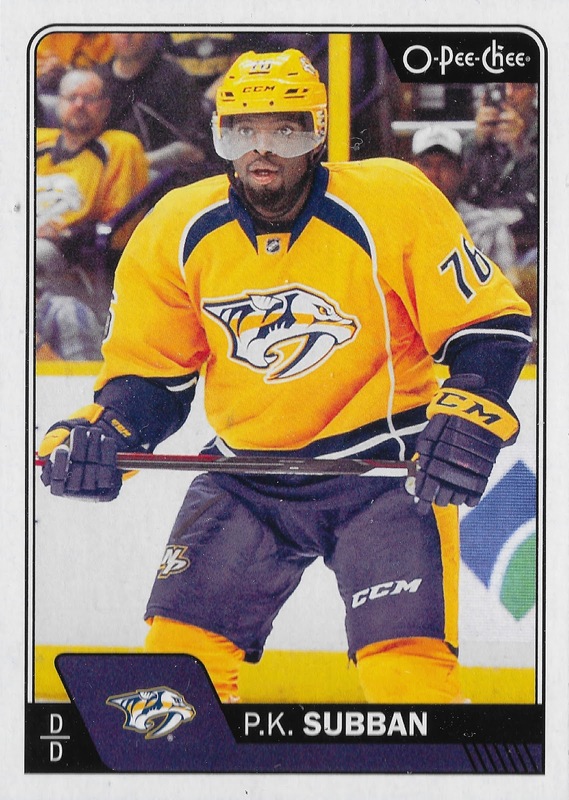 Here is another Subban card, this time from 2016-17 OPC. 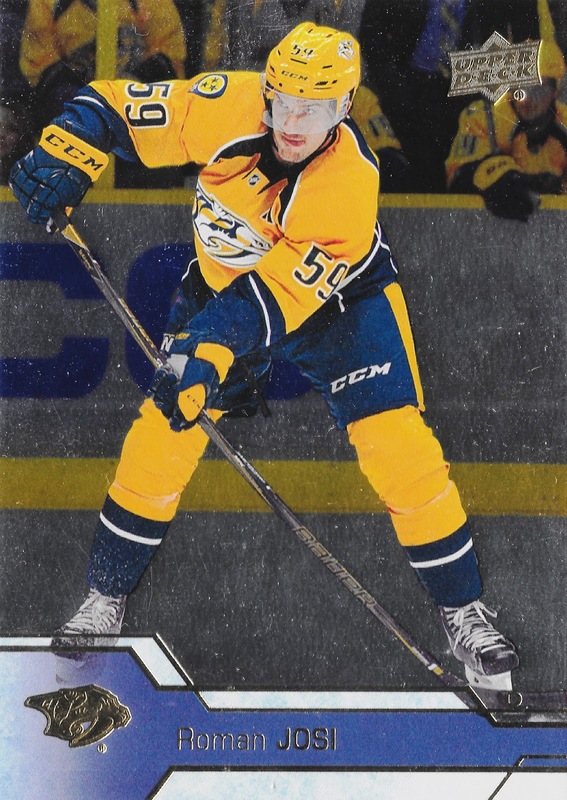 This card has a great look at the Predators gold uniforms. It's too bad they had to change things up for the switch to Adidas this season, I really liked these ones. Up next is the retro version of the same card. Not sure I really like the color combination here, but the overall retro design is pretty cool. The last card and my favorite of the bunch was this Subban from 2016-17 OPC Platinum. 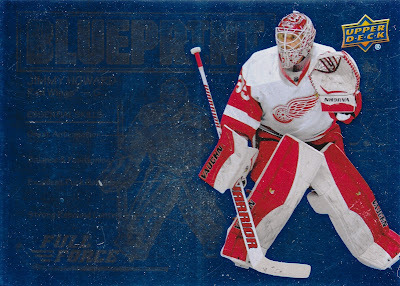 It is serial numbered on the back and comes from the Red Prism parallel set. So that's it for the new additions to my laatest side project. One of these days I will have to do some searching so I can put together an actual want list for this one. There will likely not be that many cards since I am focusing on pictures exclusively from the 16-17 season. It's been a few months now since I've been able to post one of these. This is still one of my favorite collecting projects and I love finding new cards to add to it. I was able to make this latest addition thanks to Chris over at The Collector. I was lucky enough to win the 50/50 contest recently and this was part of the package he sent my way. Thanks Chris! This card from 2015-16 Upper Deck SP Authentic is one that features one of the equipment mismatches that made me think of this project in the first place. 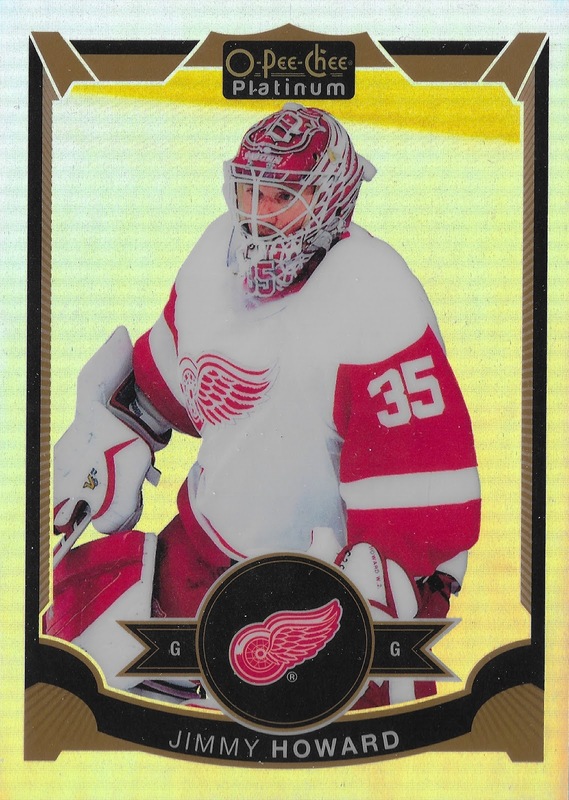 You can maybe get away with some very minor black accents or trim with the Red Wings uniforms, but is a little extreme. The pads are half black and stick out like a sore thumb. 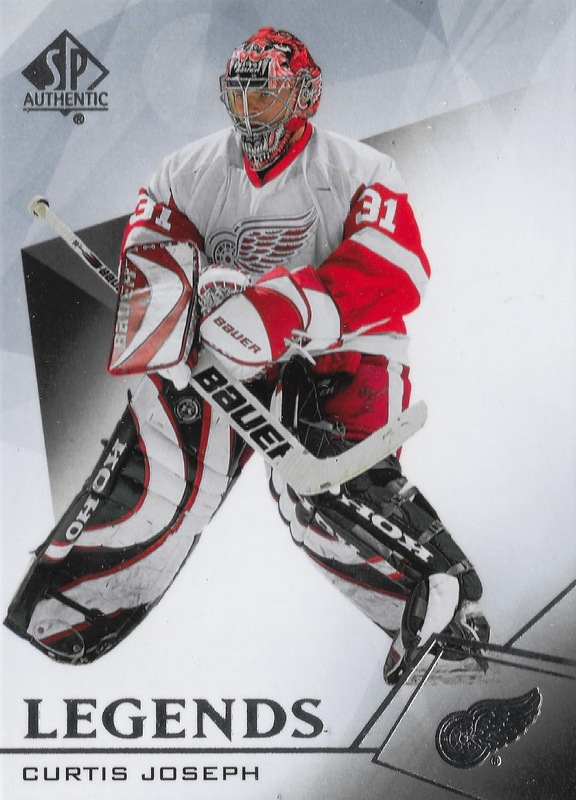 I find it kind of odd that this was the picture they chose to use considering there was plenty of time for Cujo in Detroit where he had normal looking pads. I guess I shouldn't complain though since this card fits perfectly into this project. I wonder how many more there are like this. I believe I only have one other one at this point. I've been pretty busy with my model railroading hobby lately so I haven't been buying many cards. I also had some issues with my scanner a while back so I never scanned a few things I had in my queue. One of those is a complete set I picked up on eBay a few months back. It is the Mask III set from 2003-04 BAP Memorabilia. Here is a look at the first nine cards. I already had a couple of these so they're not all new to my collection. That's ok with me though as at least now I can say I have the entire set. 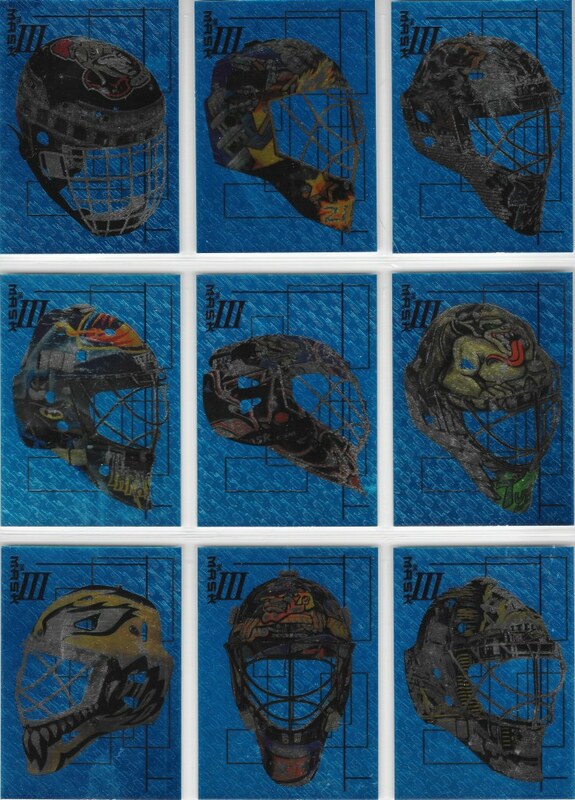 The next set of nine has some pretty cool masks too. My favorites of this group are probably Kolzig and Turco. 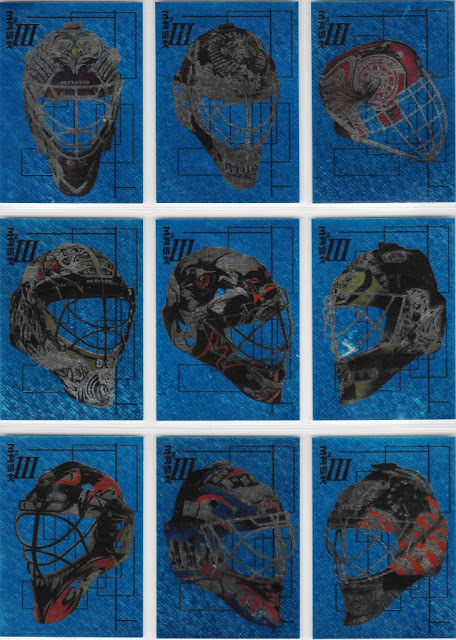 It is just me or does the Hedberg mask in the middle seem like it is on a very weird angle? I wonder why they would've done just this one differently. There were two more cards in the set, but in the interest of saving time I left those off. One thing I will say is that these cards look much better in person than they do in the scans. The masks really pop aginst the blue background when you are holding them in your hand.